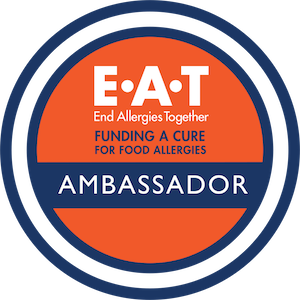 My son has multiple food allergies, so finding safe treats has been hard, but with EoE foods can be added or taken away depending on noted reactions- as a result of resent food trials and scopes, we recently have been able to add rice back into his diet. This is huge, because it greatly expands available options for meals, baking, and purchasing prepared foods. I wanted to share an easy snack we make with a few of Jacob’s safe foods: Loaded Chocolate Cereal bars. 1 cup +/- each of dried cranberries, coconut flakes, and Enjoy Life Chocolate chips [mega chunks, dark morsels or mini-chips work great]. 2-3 cups of Attune Erewhon Rice cereal- plain brown rice or chocolate rice cereals are both ideal! Melt chocolate in microwave 1-2 minutes, then stir- add time if not nicely melted.